I decided to make Baba Ghanoush today. I had an eggplant and wanted to make something easy. The recipe I used was from the Vegetarian Epicure. You remember that book. It was one of the first books in my cookbook collection. I found the recipe online, I think my copy of the book is in a still unpacked box in the garage. Of course, as usual, I did not bookmark the page and now can not find it. The internet is so large. I found a similar recipe for the ingredients, but a different technique which I may try the next time. Stay tuned for that one. For this batch I roasted a whole eggplant for an hour, skin on. I placed the roasted eggplant in a ziplock bag after removing it from the oven for 20 minutes. Then I removed the skin and placed the pulp in a bowl and mashed it up. I added 5 tablespoons of lemon juice, 4 tablespoons of tahini, Salt and pepper. And I added some Cholula Sauce because I was not using garlic. 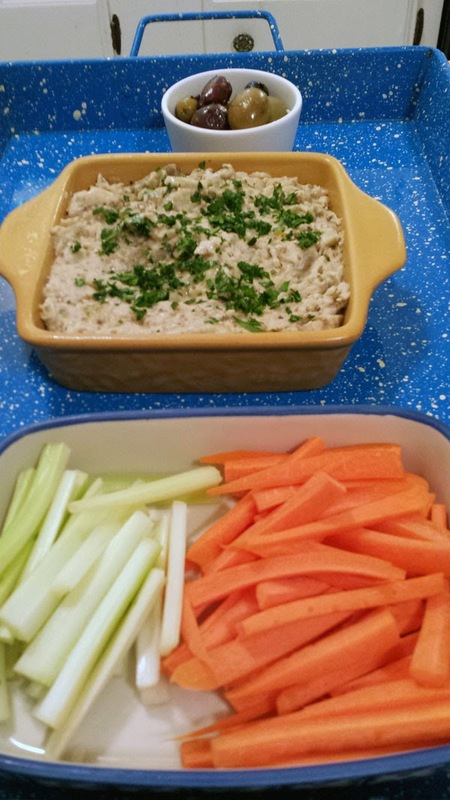 I place the mixture in a serving dish and topped it with fresh chopped parsley. And the votes are in and they are favorable. It was perfect to enjoy while the steaks were on the grill. The steaks were rib-eye, which Chris picked up on his grocery run. I am still not up for that trip. 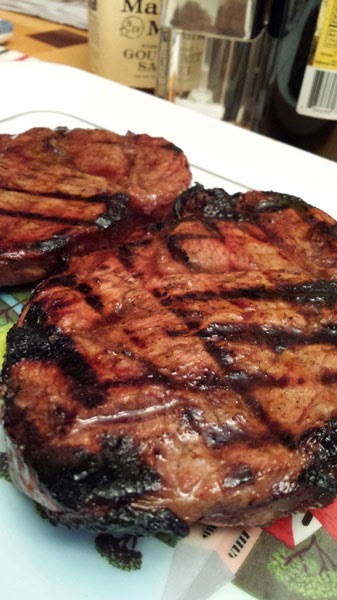 We marinated them in Maker's Mark Gourmet Sauce. They were grilled perfectly and melted in your mouth. And tomorrow is back to work.